While the fundamentals of marketing techniques will continue to stay at the core of any campaign, new trends are emerging in the market that will change the way that companies engage and relate to their customers. Limitless choices for consumers means that they need to feel a certain motivation or investment in a company that may go beyond just the product itself. Businesses can no longer just rely on the quality of their product or service; rather it must provide an experience for the consumer that keeps them coming back for more. Transparency in all business transactions will be the most important marketing trend for the future. Many times in the past, marketing included either drawing in your customer, perhaps by exaggerating products or services, or providing a great story behind your company, even if it is a bit fictional. Now, it is vital for brands to make their customer have a clear and realistic view of what they are doing, especially things that are in the interest of the consumer, at any time. Something on the forefront of this issue will also be social responsibility of companies. According to a recent article by EuropeanCEO Magazine, corporate social responsibility will be the ultimate marketing tool of the future. An increased focus on internal communications has started to become an important topic taught in many business programs today. Your employees are your first customers, as they are essentially the “face” of your brand that the consumer will become acquainted with. A company’s internal communications will soon become a valuable marketing asset, as they can be your brand ambassadors. Apple is a great example of a company whose employees embody their brand image. Traditional advertising mediums such as television advertisements still remain an important part of any strategy. With such a high degree of overexposure to many different types of marketing campaigns, customers group these together and many times do not even take notice of the individual product or service. Innovative marketing tactics will be a huge trend for the future. These need to stand out among the crowd to gain a high degree of consumer interest and exposure. 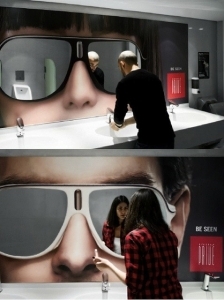 Innovative placement of advertisements, like these examples of ambient advertising is a great idea. Also, new materials such as these custom size tarpaulins from this online printing service are perfect for placement outdoors, especially for the finish line of a sporting event, for example. The world is more connected today than it ever has been before. This will continue to grow as more people, especially in developing countries with massive populations, plug in and log in to the web. While there is a distinct advantage to being able to now reach huge audiences at just a few clicks, marketing trends will see a shift from globalization to personalization in the future. Customers don’t want to be just another number or figure; they are resisting homogenization and instead searching for companies that provide them with a high degree of customization. Even though market reach is growing, marketing should be done at the regional or local level. With personalization comes a high quality customer service experience. A recent study on the future of customer service deduced that “Receiving great customer service triggers the same cerebral reactions as feeling loved”. When you treat your customers as someone you find value in, they will reciprocate and find value in your company. This can be done through little things such as providing discounts for birthdays or providing them with a free gift at time of purchase, perhaps of a new product.